I don’t normally like to post about new food on the market without offering up some kind of recipe to get everyone inspired. But for this particular product, I genuinely feel that they are best enjoyed unadulterated. MOR are a new line of sausages that launched at Tesco this month and just quietly I am pretty excited about them. We love sausages in our house but I feel guilty when time I serve them because I know full-well that they are mostly pig lips, sawdust and fat – over 20% to be precise. It’s not what I’d call good food. So when I found out that MOR sausages are packed with meat, vegetables, herbs with some varieties containing as little 3% fat, I was keen to see how they taste. To be honest, I had my doubts – I mean how good these things taste when have lentils in them, or cauliflower and chick peas? I’m pleased to report I was way off. 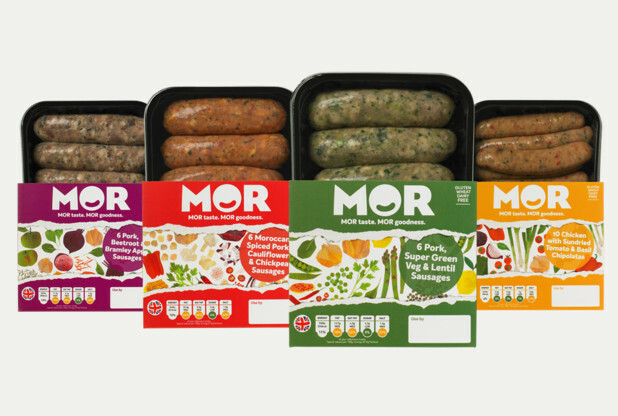 Every single variety of sausage in the MOR range tastes terrific. The textures are a little bit different, they are much more chunky that your run-of-the-mill porky white, but in a good way. They are dense but not so dense they take ages to cook. The flavours are spot on. The moisture content is just right. Mediterranean Chicken with Sun-dried Tomato & Basil Chipolatas – contain chicken blended with cherry tomatoes, red and green peppers, spring onions, red onions, basil, and sun-dried tomato paste. These are the lightest choice, with only 3% fat and 1% sugar. Pork, Super Green Veg & Lentil Sausages – contain pork, asparagus, peas, spinach, green lentils, onion and coriander tumbled in a sweet chilli dressing. These ones were my favourite. They are less fatty than your typical porky white, but offer so much more nutrition. They offer this variety as an alternative to your usual pork sausage but that’s a big leap. 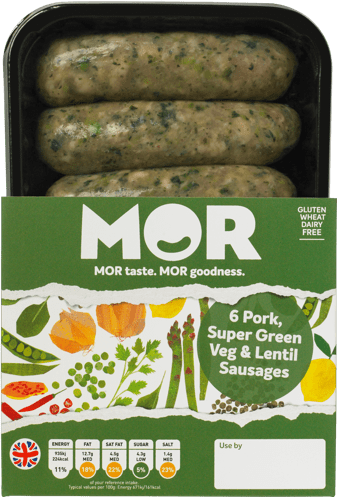 The MOR alternative is completely different, and actually if you’re looking for a more hearty, complex flavour these pork and super green sausages are much nicer than the bog-standard pork. Moroccan Spiced Pork, Cauliflower & Chickpea Sausages – contain pork, cauliflower, chickpeas, red pepper and coriander blended with warming harissa paste and a touch of honey. This variety contains 22% fat – the same as your average supermarket-brand pork sausage. Pork, Beetroot & Bramley Apple Sausages – contain pork, beetroot, and Bramley apple with spinach, brown rice, honey, caraway seeds, onion, black pepper and basil. These ones are quite sweet but very nice and have 17% fat content. The MOR team are suggesting these sausages as an alternative to your usual sausage habits. But they’re not the same, especially when it comes to fussy young eaters. In my opinion and health benefits aside – MOR sausages are better. For those who love everything about smooth, fatty pork sausages – don’t buy the MOR sausages thinking you’ll get the same experience. To get the most out of this range, it’s better to approach with an open mind and a hungry tummy because while they aren’t like the sausages you’re used to, they are a terrific addition to anyone’s weekly repertoire. You’ll feel much better about eating sausages for dinner when you eat MOR.